Manchester City drew 2-2 with Liverpool at the Etihad. 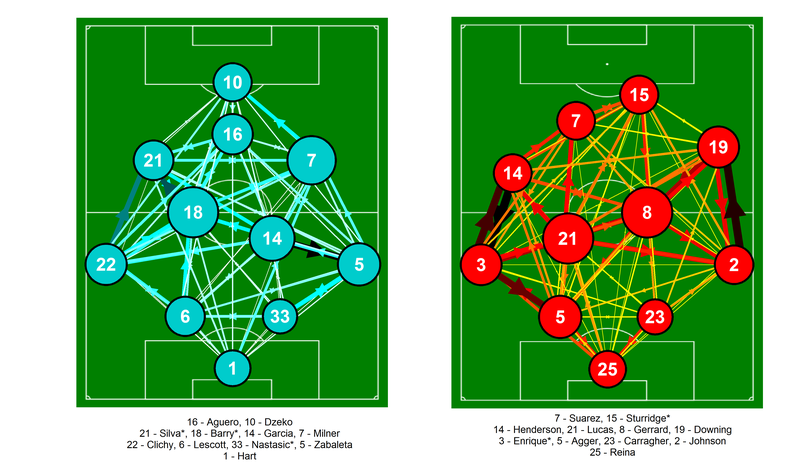 Below is the passing network analysis for Manchester City and Liverpool. More information on how these are put together is available here in my previous posts on this subject. The positions of the players are loosely based on the formations played by the two teams, although some creative license is employed for clarity. It is important to note that these are fixed positions, which will not always be representative of where a player passed/received the ball. Only the starting eleven is shown on the pitch, as the substitutes weren’t hugely interesting from a passing perspective in this instance. 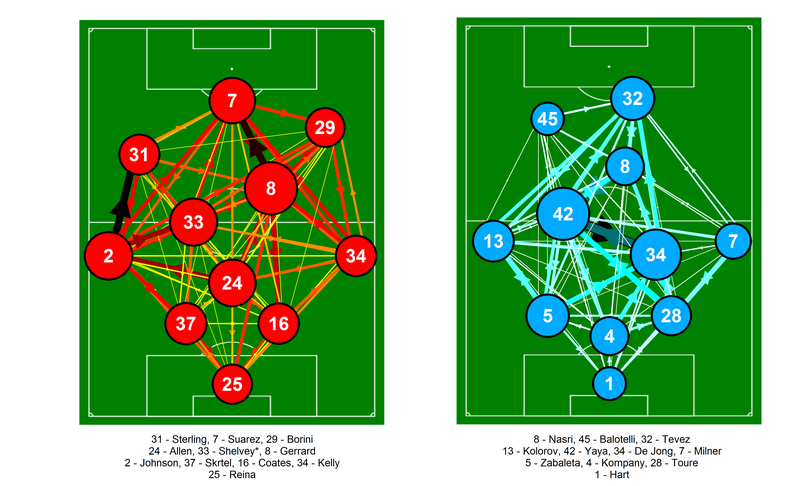 Passing network for Manchester City and Liverpool from the match at the Etihad on the 3rd February 2013. Only completed passes are shown. Darker and thicker arrows indicate more passes between each player. The player markers are sized according to their passing influence, the larger the marker, the greater their influence. The size and colour of the markers is relative to the players on their own team i.e. they are on different scales for each team. Only the starting eleven is shown. Players with an * next to their name were substituted. Click on the image for a larger view. In the reverse fixture, Yaya Touré and De Jong were very influential for City but Touré was away at the African Cup of Nations, while De Jong joined Milan shortly after that fixture. Their replacements in this game, Barry and Garcia, were less influential, although Barry had the strongest passing influence for City in this match, with Milner second. The central midfield two, Lucas and Gerrard, were very influential for Liverpool and strongly dictated the passing patterns of the team. They both linked well with the fullbacks and wider players, while Lucas also had strong links with Suárez and Sturridge. Certainly in this area of the pitch, Liverpool had the upper hand over City and this provided a solid base for Liverpool in the match. Something that Liverpool did particularly well was limit the involvement of David Silva, who posted his worst pass completion rate (73% via EPL-Index) this season. Usually, Silva completes a pass every 96 seconds this season, whereas against Liverpool it was every 162 seconds. While Mancini’s tactical change did bring Silva more into the game briefly, overall it had a negligible impact upon Silva’s influence when comparing the networks before and after the substitution. However, one of the few occasions where Silva was able to find some time and space, he combined well with James Milner to help create City’s first goal. Goes to show it is difficult to keep good players quiet for a whole match. Similarly to the Arsenal game, Liverpool showed less of an emphasis upon recycling the ball in deeper areas. Instead, they favoured moving the ball forward more directly, with Enrique often being an outlet for this via Reina and Agger. Liverpool’s fullbacks combined well with their respective wide-players, while also being strong options for Lucas and Gerrard. Strurridge was generally excellent in this match and was more influential in terms of passing than in his previous games against Norwich and Arsenal, combining well with Suárez, Lucas and Gerrard. At least based on the past few games, Liverpool have shown the ability to alter their passing approach with a heavily possession orientated game against Norwich, followed up by more direct counter-attacking performances against Arsenal and Manchester City. The game against City was particularly impressive as this was mixed in with some good control in midfield via Lucas and Gerrard, which was absent against Arsenal. How this progresses during Liverpool’s next run of fixtures will be something to look out for. This entry was posted in English Premier League, Liverpool, Network Analysis, Passing and tagged EPL, Liverpool, Manchester City, Network analysis, Passing by Will Gurpinar-Morgan. Bookmark the permalink. these 3 posts are quite neat … i like how you can see the relationship between #s 8, 14 and 21, on Liverpool’s team, change, 8’s bubble is slowly getting smaller in relation between the other two in the centre … my opinion would be that if the three are more equal it makes it harder for the opposition to know who will be the greatest influence going forward … does this fit with Liverpool’s style of play and tactics? do you notice if they are better when players are more equal in influence? remark 2 … hehe, that player #47 would get slaughtered by a coach like Bielsa … most his passes are back to #23 in the Norwich game, too cautious. 🙂 … is this why maybe in the game v Arsenal his influence was waaay down, the team decided to play the ball over the other side? Maybe why they dropped him, not ready for the big leagues? I’m assuming that the Liverpool trainer wants to play a quick, passing, forward looking style game. note: I don’t follow Liverpool (nor am I a fan) or watch any of their games, don’t really know their players (except #7, who used to play in Holland) and don’t have a high regard of the coach … I’m not interested in specific players per se (why I use numbers) just in the general tactical issues and how tactics affect play and vice versa. I like that you focus on one team mainly though, as sometimes it is more interesting to read about than general trends in the game. Your site combines well with the more general sites out there. I like the work you do, keep it up. Thanks for the comment and great points. 1. It’s a little difficult to compare across games like that in terms of the midfield as the magnitude of the influence changes across them but yes they were certainly more even in the matches against Manchester City and Arsenal. Gerrard (8) was hugely dominant against Norwich but the other two had high scores also, just not quite as large. I guess it depends somewhat on whether the more dominant players are choosing good options with their passing and how the other teams tactics adapt against them as to whether the team plays better when the players have more influence. 2. Wisdom (47) is a very young player (only 19) and yes he does tend to play the safe option most of the time and rarely gives the ball away, although I guess knowing your limitations is sometimes a good thing! He generally only plays if one of the first choice fullbacks are injured both of whom tend to see much more of the play and are more adventurous with the ball. We generally have more balance to our play when both of them are playing. Thanks for sharing this info. it was helpful.